The Rivers State chapter of the Peoples Democratic Party has expressed concern over the failure of the test run of the Card Reader Machines proposed for the forthcoming general elections carried out in some parts of the country, particularly in Rivers State, last Saturday. The state Chairman of the PDP, Bro. Felix Obuah, in a statement by his Special Adviser on Media, Jerry Needam, said the fallout of the exercise showed a total failure and an indication that Nigerians might be up to a big embarrassment should INEC go ahead to use the Card Reader Machines. The party noted that aside from reports of ineffectiveness of the machines recorded in polling units where the test run was carried out, agents of the PDP in Rivers State who monitored the exercise in Port Harcourt witnessed the flaws in the new voting technology introduced by INEC. The PDP stressed that the forthcoming general election is far too important to Rivers State people to be used for INEC’s technological experiment. In Rivers State as in virtually all other states where the mock polls were conducted, the machine’s batteries went down barely three hours of operation, the PDP said in the statement. It said arguably, the batteries running down within a space of time may be an issue in an election in which Permanent Voter Cards verification may span at least six hours. In some units, INEC officers handling these card reader machines were slow and inexperienced, while some persons were subjected to washing of hands for several times before the card reader machine could accept their finger thumb, the statement by Obuah further said. All these delays would certainly affect the time stipulated for the day’s election, the PDP contended. In view of the foregoing, the PDP said some pertinent questions beg for answers: “How does INEC ascertain and authenticate the life span of the batteries of the machines lined up for the election? 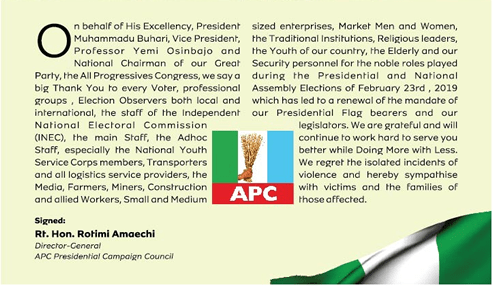 The PDP said a stitch in time saves nine. Against this background, the party said it has no confidence in the card readers based on the experience in last Saturday’s mock exercise.